Full hydraulic operation, lightweight, compact & rugged. The PRM500 marine gearbox is purpose built for use in both pleasure craft and commercial boats; its twin countershaft design provides separate oil-operated multi-disc clutches (which need no adjustment) for ahead and astern drive allowing full rated power to be transmitted continuously in either direction. To cater for the widest possible variety of boats the PRM500 is offered with a choice of reduction ratios,1.459:1, 1.935:1, 2.565:1 and 2.904:1. All can provide either left-hand or right-hand propeller rotation in "ahead", making the PRM500 particularly well suited to twin engine installations. The gearcase is constructed of high grade cast iron, internally ribbed for rigidity and strength, and consists of two separate halves to facilitate servicing, the oil pump and hydraulic control valves being externally mounted for easy accessibility. The hydraulic operating system functions on normal lubricating oil of the same viscosity as that used in the engine, avoiding the need to use automatic transmission fluid, and ensures rapid response to movements of the operating lever for good boat handling. The operating lever has a positive neutral detent and is suitable for use with proprietary single lever remote control operating systems. A special feature of the PRM500 is the direct drive power take-off which is available as an optional extra; this will power a hydraulic pump to SAE J744C type 'B' specification, thus providing an economical and space efficient means of driving on-board machinery. An electronically operated trolling valve can be fitted, which will allow variable speed of the propeller to zero whilst allowing a maximum engine speed of up to 1200 rpm. Note: These powers have been measured at the engine flywheel. Ratings have been established to ensure the long trouble free life of the gearbox which should not, therefore be used at powers in excess of those shown. Minimum - 18.27 bar (265 lb./in²), Maximum - 22.06 bar (320 lb./in²). Two tapped holes 1/8" BSP on the top, and M18 on the side of the valve block are provided so that the pressure gauge can be fitted if required. The normal operating temperature of the oil should be in the 50°C - 80°C range and should not be permitted to exceed 90°C. An oil cooler is necessary to ensure that correct operating temperatures are maintained, and two 3/8" BSP connections are provided on the valve block to allow it to be fitted. The size of the cooler required depends on a number of factors including the transmitted horsepower, operating speed, duty cycle, inlet water temperature and ambient temperature. Both ahead and astern thrust is carried by the output shaft bearings which are of adequate capacity for all factory approved ratings. The PRM500 output shaft can be rotated continuously with the gearbox in neutral. It is therefore not necessary to fit a propshaft brake when running with the engine shut down, e.g. in multi-engine installations or in motor sailers. Limited to planing hull pleasure craft; operation at full engine throttle should not exceed 5% of total time, with balance of usage at 90% of full throttle engine speed, or less. Maximum operation 500 hours per year. The selection of PRM marine transmissions according to this classification for any commercial boat, or in sport-fishing charter boats or in long range pleasure cruisers, is not approved. Planing or semi-displacement craft used in pleasure or commercial applications may qualify for light commercial rating if annual usage is less than 1500 hours and full throttle operation is limited, with most operating time at partial throttle. PRM Newage Limited recommends that all displacement and semi-displacement craft used for commercial applications should be classed as heavy commercial duty. In vessels of this type (including trawlers, purse seiners, lobster and crab boats, tugs, ferries, offshore supply boats etc.) 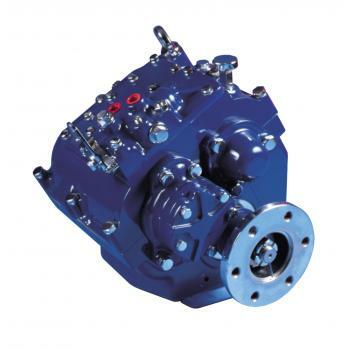 the marine gearbox is expected to work at full governed engine speed. The power setting of the engine must be known and must be within the gearbox's permissible heavy commercial rating. It is essential for the engine, transmission model, reduction ratio and propeller size to be correctly matched so that the engine can attain its rated speed appropriate to the relevant service classification without labouring. It is also necessary to ensure the torsional compatibility of the complete propulsion system from engine through to propeller, since disregarding this may result in gear noise, particularly at low speed operation, and may even result in damage to the engine as well as the transmission components. PRM Newage Ltd will provide all possible information and assistance to help find solutions to potential torsional problems, but it is the ultimate responsibility of the person assembling the drive and driven equipment to ensure that they are torsionally compatible.